Indiana coach Bob Knight made it clear to his team before the very first practice of the season: the goal was perfection. Winning a Big Ten Championship and a NCAA Championship would signify a great season. However, finishing the season without any losses was the clear expectation that Knight set in place. The Hoosiers were eager to avenge their loss to Kentucky during the 1975 NCAA Tournament, which had ended their NCAA title hopes. Even though IU had lost All-American Steve Green and “super-sub” John Laskowski to graduation, the returning talent for the 1975-76 season propelled IU to be ranked preseason #1 in the Associated Press Poll. A veteran group of seniors Scott May, Quinn Buckner, Bobby Wilkerson, and Tom Abernethy, along with star center, junior Kent Benson (one of only two Hoosiers in history to be named first team All-American three times), started out the year in high fashion, defeating the reigning NCAA champions UCLA 84-64 in St. Louis. Indiana then headed into conference play with a 9-0 record, and started off rocky, narrowly defeating Ohio State, 66-64. 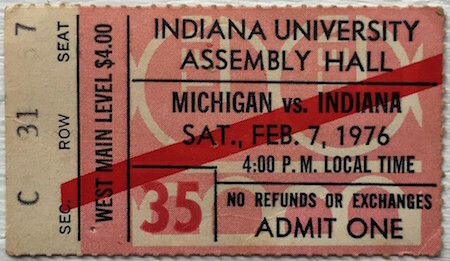 Indiana faced the University of Michigan three times during the 75-76 season, including an 86-68 victory in the NCAA Championship title game. However, the February 7th game versus Michigan at Assembly Hall may have been the most important game of the season. IU entered the home battle coming off a 114-61 thrashing of Wisconsin. Michigan entered the game ranked 16th in the country, and hoped to ruin Indiana’s chances of continuing their pursuit of perfection. Led by stars Rickie Green and Phil Hubbard, Michigan would go into halftime with a commanding 39-29 lead. IU was not used to being down at half, but was able to slowly chip away at Michigan’s lead in the second half. Indiana had the ball, down 60-58 with 14 seconds remaining. A Quinn Buckner jump shot did not fall, and a rebound attempt by key reserve Jim Crews also missed. The savior of the moment turned out to be Kent Benson, who tipped in Crews’s miss just as the buzzer sounded, sending the game to overtime. IU would go on to victory, 72-67, lead by Scott May with 27 points, and Kent Benson with 21 points. Bob Knight’s challenge to the team of 75-76 would be achieved in the end, and Indiana remains the last team to go undefeated in NCAA history.